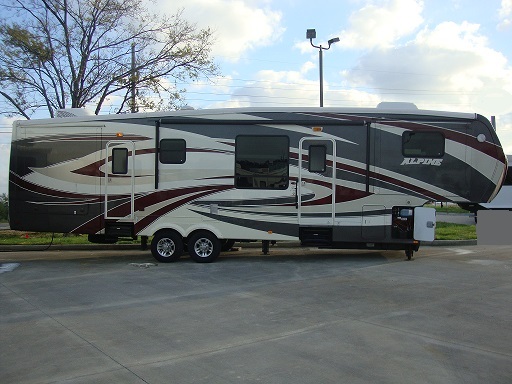 Fifth wheel travel trailers are our favorite style for a variety of reasons. We like the larger amount of storage available both inside and outside the unit and the roomier floor plans that are offered. Fifth wheels are the safest and roomiest of all travel trailers. A popular choice of full time RV-ers, these units can also be the most expensive of the travel trailers, depending on make, size, and options. Today there is a complete line of half ton towable fifth wheel travel trailers that are easily towed, but every bit as luxurious as their larger counterparts. These units range in lengths from 19' to 44', in some cases longer. They list new from around $20,000 to well over $100,000. 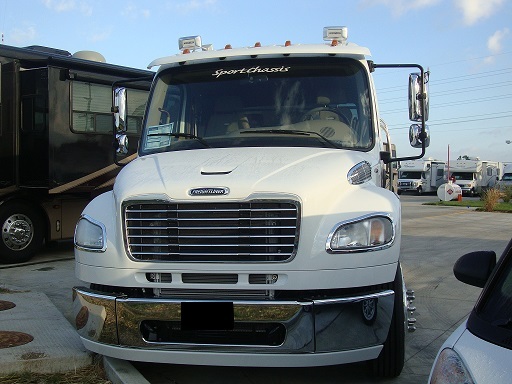 Fifth wheels come in three front end height configurations; low, mid, and full profile. The most commonly towed sizes range between 25 and 40 feet. Some of these trailers sport granite counter tops, and can be outfitted with dishwashers, ice makers, clothes washers, and driers. 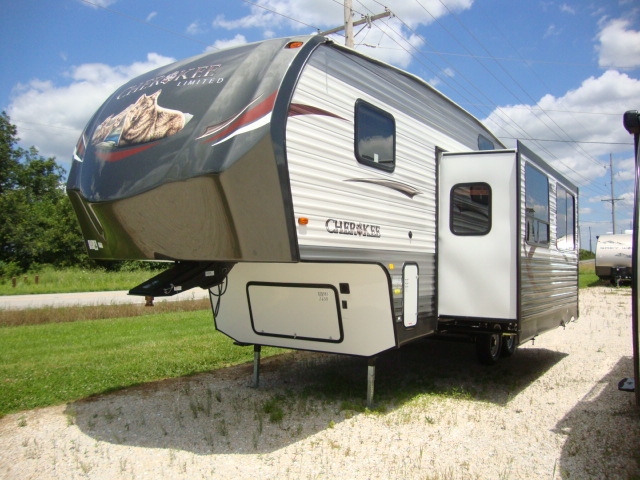 Fifth wheel travel trailers, or fivers as they are also called, are designed with a raised front end with a pin on the under part that connects to a hitch that is mounted in the bed of a truck. 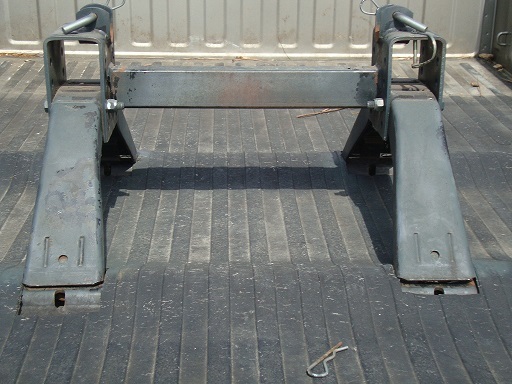 This hitching system is known as the fifth wheel, which is where the trailer derived it's name from. This system provides the most stability in towing. When teamed with a dual rear wheel truck, known as a "dually", you'll have a rig that holds tight to the road with little or no trailer sway. With a single rear wheel truck some sway will exist, but since the trailer hitch sits over the rear axle you will be able to provide greater control over your unit. As with any trailer, using extra safety precautions is advisable. While most are towed by pickup trucks, some of the longer and heavier units are towed by medium sized "haulers". There are even a few owners that have converted heavy duty commercial trucks to tow their trailers. The design of the fivers provides an awesome amount of living and storage space, which makes it one of the nicest units for traveling. Because of the raised front for the hitching system, there is naturally a great deal more available living space compared to conventional travel trailers of the same size. 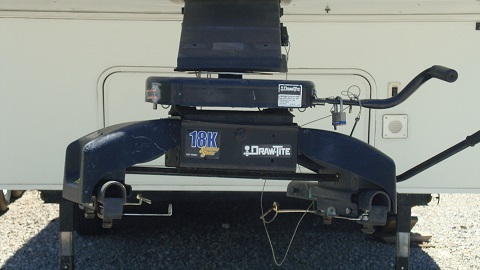 In all travel trailer styles, the units are measured from the front of the unit to the rear bumper. In the conventional units the hitch is included in the size of the unit, where the fifth wheel measurement will start from the front of the cabin. This give you less living area in the conventional because the cabin will be an average of three feet shorter than a fifth wheel of the same size. The trunk area, in most of the units, is more of a basement which is placed under the raised neck. Many units offer cavernous amounts of storage, but obviously smaller units will have less trunk space available than their larger counter-parts. In most fifth wheels, the master bedroom is over the hitch. This allows greater living space in the lower level. When slide-outs are added, you have an extremely spacious living area that provides a lot of room to move and stretch out. Here lately though, we've noticed that manufactures are starting to put the bedroom in the rear and the living room in the front. It's a nice layout, but I think that is more for people who like to either entertain a lot or for full-timers. You can still find trailers with the layout over the hitch,manufactures are just starting this newer version. 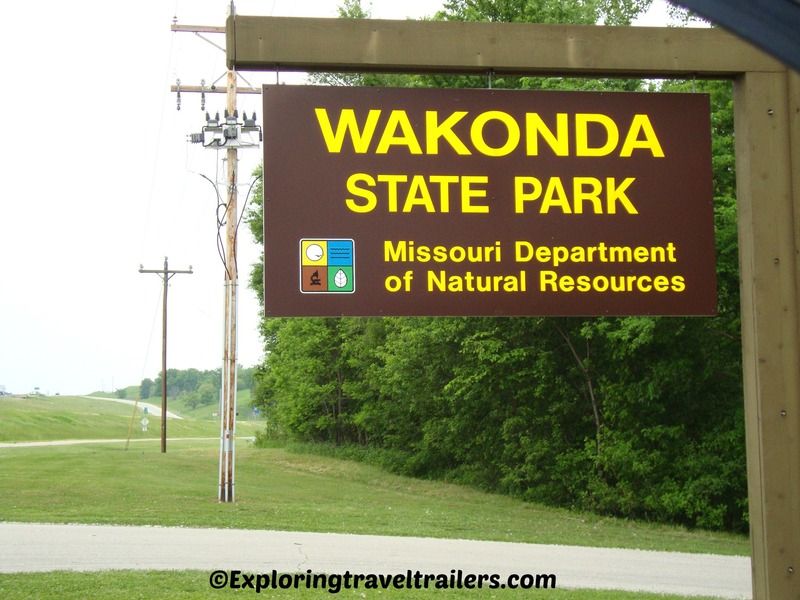 While it is true that fifth wheel travel trailers traditionally have catered to retirees who travel full time in recent years, that is not the whole story. These units have ventured into family friendly trailers that have sleeping accommodations of ten or more. They have also altered the traditional floor plan of the master bedroom in the upstairs living area. Add to that, a large line up toy haulers and you have an fiver for almost every one. The most common floor plan has the master bedroom over the hitch area, but you still have several options that change the layout of the coach. The kitchen can be located in the rear, center-left or right, and have a free standing or booth dinette. The same options exist for the living room, but computer desks and fireplaces can be added. Some units have moved the bathroom to the very front, creating a master suite. Some even include a walk in closet. The bunkhouse and loft configurations are becoming very popular. Most of these are in the 35'-41' range, but can be found in units as small as 25'. Some longer units longer units may include a second bathroom and a separate area for the bunks. Many of the bunkhouse areas are placed in the rear of the trailer, but some are placed in the upper living area. 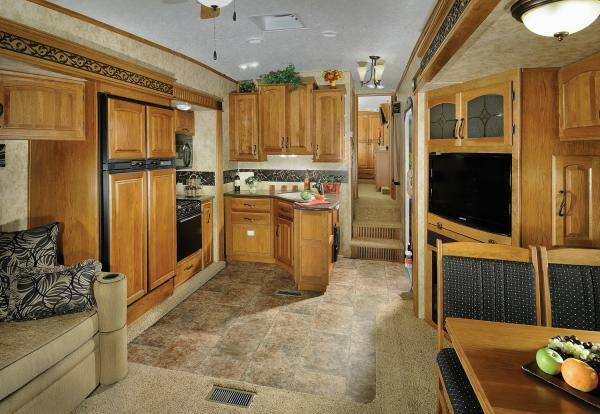 One of the more popular newer floor plans in fifth wheel travel trailers, is the front living room. This floor plan moves the master bed room to the rear of the coach. The living room area is more like a residential entertaining area with two sleeper sofas or a sleeper sofa and theater seats. Most units also include at least one recliner. Another layout option that is not quite as popular, but a great idea, is the front kitchen. Again, the master bed room is in the rear. The kitchen is a full eat in kitchen with plenty cabinet space. Some offer a walk in pantry, optional dishwasher, and ice maker. Entrance ways can be in the front-center, center, or rear of the coach. Some trailers have two entry doors, which could be on the same side or on opposite sides. A new option has placed an attached deck to the unit. Slide options can range anywhere from one all the way to six. 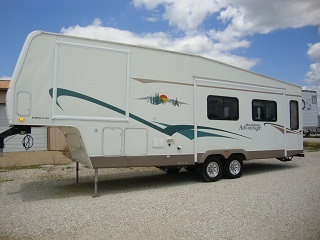 By now I am sure you can see why we love the fifth wheels so much and plan on that being our next unit. Maybe your interest has been raised. Here are a few final thoughts of things to consider before making the purchase of a fiver. 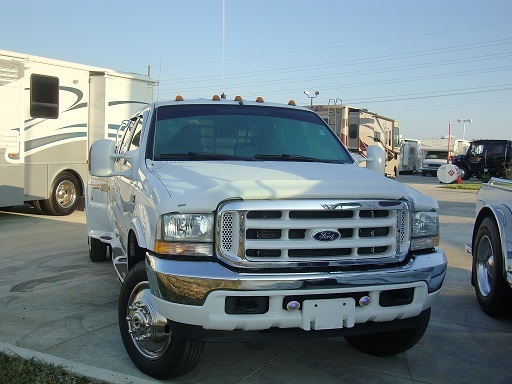 When considering fifth wheel travel trailers, remember these require a pickup truck to tow them with. This may not be practical for everyone, especially if you have a large family. Where you live may make it impractical to own one, especially if you live in a town or subdivision with narrow streets. Although, the fifth wheel might work better then a conventional, since part of the trailer is over the bed of your truck. 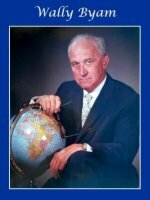 Either way, fifth wheels should be explored when looking to purchase a travel trailer.